Corn snakes (Pantherophis guttatus) are medium-sized reptiles that are frequently kept as pets. Out in nature, these solitary North American natives live in many settings, from suburban locales to agricultural sites of corn cultivation, hence the species' common name. Food-wise, corn snakes are carnivores without a doubt. These meat eaters do not feed frequently -- usually only once or a couple of times weekly. Corn snakes are far from picky eaters, and enthusiastically dine on most things that aren't bigger than they are. Rodents are their primary dietary preference, specifically mice and rats. They also sometimes feed on moles, birds, bats, amphibians and reptiles, including lizards and members of their own species. Corn snakes that live close to human beings are often considered helpful for managing rodent populations. The youngsters of the species are particularly fond of tree frogs. Since corn snakes are classified as constrictors, they consume food by seizing their targets using their teeth. After they do this, they envelope their prey animals' bodies using their coils. 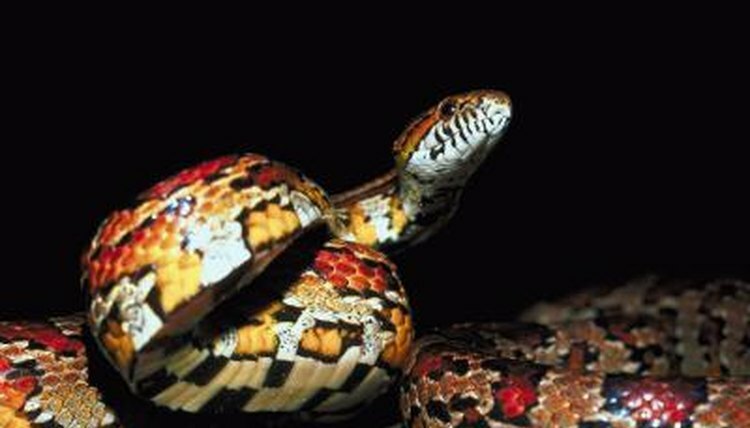 Corn snakes then apply pressure to their prey, which leads to asphyxiation. Finally, they gulp their meals down in one fell swoop, no chewing necessary. As pets, young corn snakes generally consume tiny pinky mice. They only need to do this two times each week. With maturity, it's acceptable for corn snakes to consume bigger mice, and only once weekly. Mice for feeding purposes are usually available at retailers in frozen form. It's crucial, however, to abstain from feeding them while still frozen. Thawing is important, and room temperature mice are optimal. Mice aren't the only appropriate type of corn snake sustenance, however. The young ones also occasionally eat frogs and lizards, while their grownup counterparts occasionally consume birds and bird eggs. Corn snakes that live as zoo captives eat similar meals -- think chicks and rodents. It is vital, for safety purposes, to avoid feeding corn snakes using your hands. Gripping tools are a much more secure option. If a corn snake for whatever reason ignores anything you give him to eat, take it out of his living environment after approximately 24 hours have passed. Abstain from giving corn snakes crickets, since crickets aren't understood to be sustenance by these snakes.